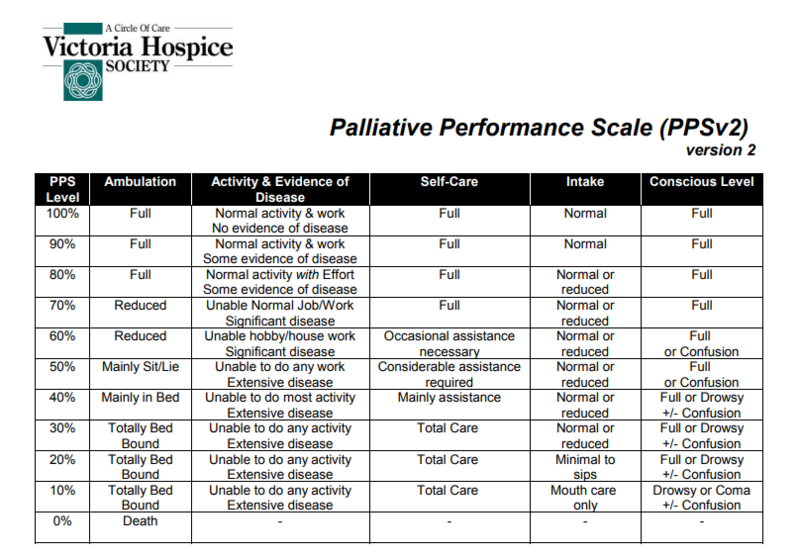 The Palliative Performance Scale [link is to the pdf of the chart and how to use it]. assigned as the PPS% score. (columns to the left of any specific column) are ‘stronger’ determinants and generally take precedence over others. good intake would be scored at PPS 50%. care including lift/transfer. The patient may have normal intake and full conscious level. is used to determine whether 40% or 50% is the more accurate score for that patient. measurements and comparisons. Finally, it appears to have prognostic value. horizontally across each row to find an overall ‘best fit’ using all five columns. ‘sit/lie’ and ‘bed’ is proportionate to the amount of time the patient is able to sit up vs need to lie down. person is still able to walk and transfer on their own but at PPS 60% needs occasional assistance. complications with or without continuation of active antiretrovirals, antibiotics, etc. The above extent of disease is also judged in context with the ability to maintain one’s work and hobbies or activities. sometimes even close to death (eg. trying to walk the halls). their own means, but that on occasion (perhaps once daily or a few times weekly) they require minor assistance. his or her own accord. according to fatigue during the day. clinical situation, the patient may or may not be able to chew and swallow food once prepared and fed to him or her. Changes in intake are quite obvious with ‘normal intake’ referring to the person’s usual eating habits while healthy. ‘Reduced’ means any reduction from that and is highly variable according to the unique individual circumstances. ‘Minimal’ refers to very small amounts, usually pureed or liquid, which are well below nutritional sustenance. throughout a 24 hour period. This entry was posted in 2018 Blog Posts, Family Medicine, Geriatrics, Health Monitoring Forms + Questionnaires, Hospice Care, Internal Medicine, Palliative Care, Prognosis. Bookmark the permalink.